Sorry Assiduous (adj.) SAT-Takers, Linguist In Dudgeon (n.) Over Vocab Flashcards Many students prepare for the SAT by drilling themselves on esoteric, arcane and recondite words — like esoteric, arcane and recondite. Linguist Geoff Nunberg doesn't discourage these efforts, but he does have a word of caution: memorizing a definition is hardly the same as learning a new word. 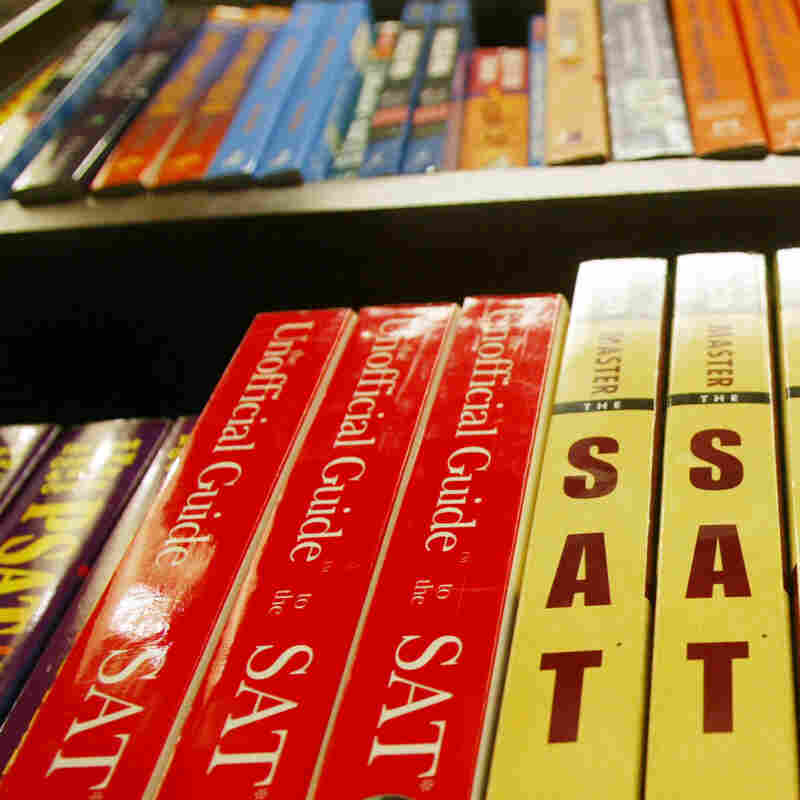 Decades ago, the SAT test was seen as a measure of raw ability, not as something students ought to cram for. Now, test prep is a huge industry. Linguist Geoff Nunberg wonders what exactly students learn when they're flipping through vocabulary flashcards. It wasn't until the test-prep industry took off a few years later that people realized you could work the system, and students began boning up on the words that were likely to appear on the exam. "SAT words," people called them, with the implication that they existed only to be tested. If you wanted to use a word like "vociferous," you'd add the tag "SAT word" to signal that you weren't showing off. Now the new College Board president, David Coleman, wants to sweep away all those writerly words like "mendacious" and "jettison" that students learn for the exam. They're to be replaced by words like "hypothesis" and "transform" — what Coleman calls "the real language of power." That's a turnabout for the College Board, from insisting that the exams were uncoachable to saying, "Well, since students are going to prep for them anyway, we'll tell them what they really need to know." But it also falls in a great American tradition of self-improvement through word power. As one 1942 vocabulary guide told its readers, "Your boss has a bigger vocabulary than you have. That's one good reason he's your boss." That faith in vocabulary begins with the belief that every new word you learn comes tied to a new idea. But the words you study are always tied to old ones. That's what flashcards are for, to pair exotic words with familiar ones: "amicable" means friendly, "superficial" means shallow. That's all you need to know to answer those SAT sentence-completion questions. "They tried to interest her in many things but they couldn't overcome her _______." Should it be (a) apathy, (b) fervor, (c) acuity or (d) aloofness? It's "apathy," of course — what they want you to do is fill in the blank with the word that makes the resulting sentence least interesting. But if big words were just synonyms for littler ones, they'd be useful only for show — as James Murphy put it in a recent Atlantic piece, they'd be like the parrot's plumage, not its beak. True, if you stumble on "esoteric" somewhere, it can help to be told that it means "obscure." But the real breakthrough comes when you realize that it doesn't. "Esoteric" only comes into its own as a concept when it's jostling in your mind with "obscure," "arcane," "recondite" and the rest. There's really no way to test whether somebody has learned a new concept along with a new word. You couldn't ask a sentence-completion question that required someone to choose from among "esoteric," "obscure" and "recondite." There'd be no clear right answer; they're too close for the context to tease them apart. Here's a tip for high-school seniors: If the answers to a sentence completion question contain two near synonyms, you can be sure they're both wrong. How do we learn these distinctions, anyway? We can't usually get them from context alone, or the SAT could test for them. Dictionaries are no help — they'll define "esoteric" and "obscure" in pretty much the same way, or sometimes even in terms of each other. A classical background might be useful if you're stuck on "recondite," which comes from a Latin word meaning hidden. But it won't help you distinguish it from "cryptic" and "abstruse" — they come from Latin words that mean hidden, too. Learning what "hypothesis" means won't help you learn science; it's the other way 'round. You can't really learn the meaning of a word until you understand why it matters. Take Coleman's example of "hypothesis." The dictionary defines it as "an assumption made for the sake of argument," which is all you need to know if it comes up on an SAT question. But even if they know the word, high-school students don't say things like, "My hypothesis is that Elaine turned you down because she thinks you're a drip." That's not just because the word is fancy, but because it's of no use to them. "Hypothesis" only matters when you find yourself in a situation where it's important to be explicit about the steps of logical deduction, as it is in science or detective work. But you can't pluck the word out of its native habitat to put on a study list and imagine that its meaning will still be clinging to its roots. Learning what "hypothesis" means won't help you learn science; it's the other way round. Still, it doesn't hurt to put the words out there on the vocabulary lists, even if they're going to lie dormant until they're needed. I asked my daughter if she recalled any of the items we went over on flashcards when she was preparing for the SAT about seven years ago. "The only one I remember is 'ephemeral,' " she said, then added, "I'm aware that there's a certain irony in that." But my guess is that three-quarters of the words we looked at are lodged in her vocabulary by now, to the point where it feels as if they've always been there — like all the words I circled in the Readers' Digest feature "It Pays to Increase Your Word Power" when I was 11. I can't recall any of them now, but that's to be expected. If you can still remember where you learned a word, you probably haven't used it a lot since then.